To presserve lyfe and to retreeve those claymed by its watters. To reckord the happnings in the river’s oan voyce. “I’m no’ Riverkeep yet,” said Wull. Never, he thought. Pappa secured a knot and sat back on his haunches. “But a week’ll no’ be long passin’, my boy,” he said. “Time feels long for the young, but don’t worry—ye’ll no’ be young for long.” He grinned and went to get the boat ready, ruffling Wull’s hair as he passed. The deep creak of his rubber boots faded into the gloom beyond the lamp. Wull did not want this wilderness life. With Pappa’s help he had read the ledgers in their entirety, right through the ninth volume in Pappa’s own careful hand. The ledgers didn’t just list the dates; they told the stories, detailed bodies’ decomposition, and kept the words of the rescued and their reasons for jumping: sweethearts, fear, sicknesses of the mind, and often, so often, “coin.” At first Wull had taken this liter- ally, as though they were jumping into a wishing fountain to fish for pennies. Then he had realized and felt like a foolish child. He reached over and touched the ledger that sat open on the desk. Their last discovery had been just over a week ago: 3,101, a widow, faceup and floating, her breasts rot-swollen, her cheek cut with a debtor’s mark. But as always the most recent entry was the next number—3,102—offered with the prayer of the Riverkeep: that the number might be never filled. He closed the ledger. The mold-edged pages, heavy with moisture, fell with a report that bounced round the boathouse like the slamming of an enormous door. Wull heard the creak of Pappa’s boots in the darkness. Pappa regarded him a moment, shifting the wad of lakoris leaf around in his mouth. Then he shook his head. “Yer nearly sixteen” was all he said. The air was sharp and hard in Wull’s lungs. Even wrapped in layers of seula gut, he felt the chill on the exposed flesh inside his boots and around his waist like the cut of wire. The white, still world communicated itself as a sharp whine outside of his hearing, and he stamped his feet on the bäta’s exposed ribs and buried his face in his elk-fur collar, peeping over when his eyes could stand the cold. The lanterns, staked in the riverbed where the currents met and the flotsam gathered in eddied clumps, made glowing islands in the velvety darkness, their flames fuzzed in the fog like dandelions. The industrial might of Oracco was silent, the howls of its foundries and smithies carried away on the east wind. The only sound in the smothered world was the rhythmic clicking of the oars and the soft noise of the blades moving through the water. By the fifth lantern, they had discovered a graygull, torn open by a seula—“Not much else left for them,” Pappa said— and the broken spokes of a carriage wheel. The gull was flap- ping limply, trying to fly on shattered wings while it bled onto the ice. Pappa reached down and gently snapped its neck be- tween his thumb and forefinger. Wull watched him ease the body into the water on scar-twisted palms. As far out as the edge, at lantern twenty-two, they still had found nothing more than knots of weed and grass clinging to the ice rods. Wull peered into the unseen and untended wilderness beyond the last outpost of the keep’s realm, in the depths of which lurked the bustle of Oracco’s ports, the flashing steel of bandits, and, past a scattering of hamlets, the Danék’s estuary and the wider sea. He trailed his glove tips in the water and flicked droplets out toward the beyond. Pappa saw him, tut-tutted, then—as he turned the bäta toward the boathouse and its warmth— they found 3,102. It was male, fat-backed and facedown, white flesh streaked with a pattern of cuts and bruises Wull knew came from the fierce, swirling currents near the footbridge where Mamma had drowned. It had been wearing a uniform that still clung to it in scraps, and there were murky tattoos spilled along its visible skin. Pieces of its scalp were missing, and leaks of blood and fluid colored the wafer of snow-dusted ice that had crept around it. Wull took the oars, turned the bäta, and heaved it for- ward. Even now, its great weight pulled at him as though it might shatter his wrists. He looked down at the floating form of 3,102. It looked bunched, not loose, and sat tightly in the water. The ice must be holding it steady, he thought, dropping the oars and stilling the bäta. He stood as Pappa stood. The painted eyes on the bäta’s prow faced stoically forward. Half-shut and focused, they peered into a darkness that, beyond the reach of the lantern, was absolute. Wull turned from them to the reassurance of the flames. Without the movement of the boat, the silence was so empty he felt the weight shift in his stomach and the hair creep on his back. Pappa tipped back his hat and muttered the Riverkeep’s prayer, then, broad back braced and legs wide, he reached down for that hug to pull the wretched lump into their boat. In a flurry of movement that lasted no more than a gasp, the two figures disappeared beneath the surface, and Wull stood rigid, his breath billowing and his skin tight. In the instant his pappa had vanished, he’d seen a brown mouth, opened wide like a snake, and two eyes that glittered like razors. The eyes had met Wull’s. The water was still. There weren’t even bubbles. Fighting the sudden lightness in his skull and with a kick of painful nausea taking his wind, Wull began to sweat, feeling panic speed his heart. He stood still for a timeless age, unable to move, listening to the silence and staring at the space in the water through which Pappa had vanished, trying to force his lips to form Pappa’s name and sending only the tiniest wisps of breath into the freezing air. It was the cold that brought him back to himself, needling wakefulness into his muscles. For the first time in his life he was aware of the thinness of the planks that separated him from the black void beneath, and he felt the emptiness of the world like a fist in his gut—felt the distance of other people as he never had before. Wull heaved the oars into place and sat in the keep’s chair, tears freezing on his cheeks, his gaze locked on the spot where Pappa had vanished. Pappa had shown him how to row—then made him practice until his knuckles bled—but his return journey took an age, weakened by terror and blind to his destination, branches scraping the prow behind him. A seula broke the water beside the boat, its golden summer eyes now a piercing winter’s blue, and Wull dropped the oars in fright. The grabbing shadows of the banks reached across the white water, and beneath him the river moved un- usually, each swell and press of current renewing the feeling of the razor eyes slicing into his, and he prepared himself for the water to rise up and take him. 3,102 was waiting for him on the sand. Faceup, the sight was no better: the face was fish-picked and rotten, the guts torn by an adventurous seula so that its stomach hung open like a bag of wet coal. Its uniform was that of a seafarer, and a broken musket still hung from its belt. It wasn’t moving, and seemed to be quite dead. With a huge effort of courage, Wull threw a stone at it. The pebble bounced harmlessly off the hollow body as though it were nothing more than a sponge. Fearing to expose himself to the thing unguarded, he backed into the boathouse and closed the door. By the time he reached the window, it was gone. Wull stood at the window for as long as he could before releasing his breath and clouding the glass. Then he went and made himself tea, focusing on the loose leaf and the water and the stove’s flame to ground him, to bring him back to normality; in a world of tea and unreliable matches there could not also exist corpses that moved. There could not exist an absence of Pappa, as there could not be an absence of sky or air or water. He pictured Pappa, thought of his voice. The ledger, Pappa would say. It’s the record of the River- keep. Of us. Wull drew the book to him and lifted the enormous cover. As it fell open he thought of the movements that might be hidden by the sound, and he glanced around him, into the corners left by the flickering lamps. The bodie of a mann found by lanttern twennty-two, he wrote carefully, elbow pointed, swolen and white haveing been tampered with by the rockes and fishes and a seula. Stomack open and black. Unabel to returne bodie. Gonne. Wull lifted his tea, then lowered the mug without drinking. He raised the pen again and wrote the next number—3,103—then sat back, tears creeping onto his face. He felt that his blood, rather than ink, had stained the parchment. “May this number be never filled,” he whispered, eyes closed in prayer. The timbers of the jetty creaked, steadily, and the sound grew larger until the footsteps reached the sand and ceased. There came a new sound, of creaking rubber boots. They reached the door of the boathouse, and Wull could sense the angry weight on the other side, a plank’s thickness away, and he knew it was his pappa as he had always known him—heavy with lakoris and slow of movement—but there was something else there now too. Wull began to sob, forcing his eyes to remain closed. The movement behind him stopped. “Amen,” said Wull. and guardian of the catch, her strong arms clutching a basket of pickerel in hopeful prophecy of the town’s survival. The people kneel at her feet, hands upon them in prayer: let the catch be as fruitful as the day’s past— and tomorrow’s even more. In the face of danger—high winds or worse—legend says the Mother’s feet find firmer footing. She is ever vital and protective. The fishing village of Canna Bay sat in the Danék estuary between a mountain and the sea: a glistening lump of white houses, lanterns, and shining cobbles that rang with midnight voices and through which the stink of fish guts and sea rot moved like sharp fog. Its buildings were tin and split wood, held together with struts and nets and oil-stained ropes. Between them ran lanes carpeted by the leavings of the markets and the gulls, weeds and grasses pushing through the fish heads and bracelets of scales into the woodsmoked air. A few hundred yards from the line of the pebbled beach, in the depths of water that was as black as tar and tossed ragged by the wind, the mormorach emerged. It fought through the seabed with the violent wriggle of a birthing snake and then, freed from the slumber of eons, let its momentum carry it upward, its sensory system taking stock of its changed environment. Along its great length, tiny hairs and vessels tested the newly freezing water, and the big heart behind the first row of pectoral fins quickened at the shock. It flexed its jaw, testing the silt and champing once, twice, feeling tusks clasp against its face. It called out, a low, sonorous boom that shook the water around it and made the blind darkness come alive. The mormorach saw everything in its phosphorescent glow: small fish, the rugged topography of the seabed, thick tangles of weed, and the hulls of craft. There was landmass, too, with channels of open water ahead and behind. The creature rotated slowly in the water, letting the current guide its path. As it moved, the hairs on the tip of its beakish face sensed distant fish, the crackle of their oily skin sending a command that passed through the brain to the tip of the enormous tail, which thudded once, like a whip, and drove the mormorach into the dark. In the village, the gloom of the clouded night matched the water’s murk. Emory Blummells slipped out the front door of his cottage, clipping the handle back into place with practiced ease. He pressed some lakoris leaf into his top lip, looked around, and sniffed the air—the salt of the water and the sourness of landed seaweed. The clouds were thick, and the roaring wind meant he could hide behind a cloak of noise. Conditions were perfect. He grinned to himself, teeth lost behind his wispy beard, as he hurried through the closed market with the quick steps of a fat-legged man. His wife would be annoyed if she woke and found him missing, but she’d be pleased with the big pearl trout they’d have tomorrow. Emory remembered the days when she would come with him on his nighttime journeys: sneaking around together in the shadows, finding each other’s hands, and stifling their laughter. That was a long time ago—before their children, when they’d been young together. As he reached Main Street he ducked into the tree line, his nostrils filling with the smell of earth. The line of the hilltops and mountain was a smudge against the night sky, above the glow of the lanterns in the center of the village. The fish factories were still awake, laughter and song ringing tin walls seamed by slits of lamplight as the women and men stripped and cooked and packed the day’s catch in boil jars to feed Oracco’s fat stomach. Emory moved silently along the seafront in the bushes, parting the damp leaves with his fingers. A packer stepped out from a glowing doorway, steam rising from his naked torso, then turned and urinated against the factory’s wall. Emory looked up to the moon, glowing like a silver coin behind the clouds, then eased himself into a deeper shadow, crouched low in a flower bed beneath the window of a sleeping cottage, absently turning his green- stoned wedding ring as he waited for the hot stream’s thrum to stop. He was good at waiting invisibly. Once, when he’d been after fowl in the Rydberg Woods, a red balgair had peed on his boot. He’d worn the stain on the leather like a badge of honor, but had to endure the frustration of keeping its origin secret. Emory could keep secrets; like everyone else in Canna Bay, his bones shook with them. As the beat of the packer’s water was replaced by the crash of waves, Emory sucked on his lakoris and spat noiselessly into the tin-smelling earth between his boots, neck wound into the high collar of his coat and his hands elbow- deep in the pockets. He counted to sixty, then he spat again and moved forward. When he reached the harbor, he used the moon’s weak glow to light the ground, picking his way delicately between the weed-filled cracks, coils of rope, and rusting chains. Bleached-looking buoys were bundled together like giant grapes against a crumbling wall, and the hulking shadows of landed craft loomed comfortingly over him. As the gray- gulls padded on the masts, Emory caught his breath beside an ancient anchor, then began to cross the reams of spongy, crackling seaweed on the beach. The water, when it came, was cold enough to bite through the thick rubber of his wading boots, and Emory shivered happily as he hobbled into his skiff. His thick, sure fingers loosed the line that bound it to the jetty and found the oars by touch; then he pushed off, dipping the oars’ blades silently into the water. and echoes that shivered along its body. It switched its focus from the shrill anxiety of the shoal it had been tormenting. The mormorach’s brain recognized food in the patterned sequence of the distant splashes and, with another whip of its tail that scattered the fish like dandelion seeds, it thrust itself toward shore. Emory looked back at Canna Bay through his own panted fog. The water was choppy, but he was an experienced rower, and his rhythmic strokes allowed him to settle once again into his reflective mood, the wind tugging at his thin mustache and pulling drops of water from his eyes. The bustle of the village could be sensed even at such a distance and such an hour, the murmur of voices in the shrinking specks of light thrown into the air with the smoke and the steam. The breakwater reached out alongside him, a broken finger of piled stone, the silhouette of the Mother’s statue at its tip. The village’s houses were mostly in shadow, lit at intervals by the lighthouse’s sweeping beam. His own house was among them, and he thought of his wife sleeping there, snoring gently, pictured the familiar things of his ember-lit bedroom around her, and shivered again to think of its warmth finding its way back into his frozen toes when he returned. He passed a few moments spotting the roofs of the other Blummells in Canna Bay: so many that an intricate system of bynames had sprung up over the centuries. His own family were the Blueloon Blummells, named for the color of woolen stockings his great-grandfather had worn to sea; next door were the Cutblade Blummells and, three cottages seaward, the Corry Blummells. Emory paused in his rowing for a moment to hoist his own blue stockings to his knees. By the time he had reached the open pen of the trout farm, he had been rowing for more than twenty minutes and his elbows had begun to ache. He fixed the skiff to the pen and let it drift a moment. It was even colder so far out on the water, and he fancied that his mustache had begun to crisp in his mouth’s fog. He pulled a few fresh strands from the lakoris pouch and pressed them between his lip and gum. Forty yards below, the mormorach circled on the seabed. The oils of the fish behind the net were thick in the water, clouding its senses. The splashes above had stopped, and it could not yet see the skiff. Instinct told it that a roar could drive away its prey, and so it waited, moving patiently, its every fiber delicately triggered for a sign of movement on the surface. Emory cracked his knuckles one by one, then lifted his net. It was about the size of a cooking pan, with a long, f lowing mesh. It hardly needed its size—there were thousands of fish in the pen and they were all as greedy as they were stupid—but it made a straightforward task simpler still. He crumbled some meal between his fin- gers and sprinkled it on the surface. Any minute now he would see their pale shapes, then all he had to do was extend the net and let the fish swim into it. It always seemed strange to him that a pearl trout, so delicious and strong, could be so blind—so unknowing of its fate. A sudden wave made the skiff lurch, and Emory staggered back, righting himself on the seat. The mormorach’s senses were now brightly alert, and it dipped a pectoral fin to align its vision with the wide shape on the surface. It darted quickly forward. Another wave sent the lakoris pouch from Emory’s pocket and through the air. It landed with a tiny splash, barely rippling the water. The mormorach thudded its tail and rose like a meteor, smashing its face through the frail hull of the skiff and clamping its jaws around the soft thing it found there, a roar of satisfaction trembling through its muscles. It sailed through the air, twisting for joy through the beam of the lighthouse before crashing back into the water and whipping its tail to drive toward the seabed. Emory felt only the heat of his blood surrounding him, the pain in his guts throwing the rest of his senses around in confusion. As the mormorach drove him through the freezing dark and the pressure began to pound his skull into unconsciousness, he reached down instinctively, touched scales and bone, and his hands filled with a warm, slippery mess. Just before Emory’s heart stopped beating, he had time to understand that he was holding his own guts—that the creature had bitten him open. And, unbidden, from a flash of light in his brain, the word intestine came. . . . Then he was a young man again, holding hands with his wife in the Rydberg Woods and kissing her for the first time. (the ingestion of which fuels aggression) means even well-armed huntsmen shy from their pursuit. The boards were foot-slipping glass, slicked with invisible slime from the kiss of dew and the frozen moisture in the air. Around him the snow swallowed nature’s sounds, and the world was still and calm, the midafternoon sun white and heatless behind the clouds. The fog of the day had mixed with tendrils of smog from the far-off city, and through it the bäta’s painted eyes, heavy and staring, watched Wull at his task. He drove his boot edge into the slats and heaved again at the ice rod. But the force of his strength, though it brought pain into his neck and spots to his vision, set only the bäta to rocking, the rod unyielding in the crag of white that covered its bottom half. He cursed himself for leaving it so long—and for letting the lantern burn out. Without the flame to warm the iron, the ice climbed freely and choked the river an’ the traffic an’ the creatures what lives in it. Wull heard Pappa’s voice in his memory, and pulled his hat tighter about his ears. One winter they had found a body stuck headfirst in the frozen ground beside a burned-out lantern. The ice had covered it to the waist so that the torso and head were preserved as though the man was holding his breath; but he had been picked clean from hip to toe by the insects and the birds and the elements, so his skeleton was shining and bare. When they’d lifted him, the legs had collapsed, all the connective- ness taken by the mouths of hungry things. That was why the lanterns were lit, Wull knew: so water flowed and the fallen stood a chance. And he had let lantern one extinguish. Of the remaining twenty-one there would be more gone cold, their wicks frozen into black stumps and their rods locked into immovable, glistening rock. His second day as Riverkeep, and already the threads of it had slipped from his grasp, pulled away like weeds in the current. He stilled his movements and felt the surge of the river beneath him, its constancy and strength pushing against his fumbled knots; never waiting, never resting, the splintered ice—shot through with scattered-seed bubbles— closing round the bäta like a fist. What had seemed in Pappa’s keep a peaceable realm— where the bäta moved on rails and the lamps were a ceaseless barrier of heat and light—now seemed a frozen chaos. The lanterns’ placement, catching the swirls of current for centuries, now seemed foolish; reaching number one meant he’d had to row against the flow at its strongest until the sinews of his back felt they might snap. And when he’d made it, sweat frozen to frost on his skin and his lungs reduced to stinging, flapping bags, he found the replacement whale oil (Reekin’ liquid gold, this, Pappa whispered in his mind) was near empty and he would have to return to the boathouse, top up the fish-stinking bottle, repeat the whole journey, andthen find his way backward through the fog and the rocks and the trees to the next silent, frozen pole, turning every few seconds to check his course and losing what tiny momentum he’d achieved. He’d never seen his pappa refilling the whale oil. It was always full. Riverkeep. He felt the idea of it sitting on him, like a coat of paint that wouldn’t dry. In his two days, he had been sent for to clear the Oracco Road of andal-geese who had honked and hissed and bitten chunks from his trousers. The guardsman had asked where his father was, and Wull hadn’t known what to say for such a long time that the man filled the tortured silence by burping and swearing at the weather. In the time he’d been on the river he had recovered: another pair of dead gulls; the skull of some flat-toothed animal, bulbous and thin where the brains had sat; a grass-sewn cloak; the wrought-iron door of a city furnace stuck to a raft of plants, hinges burst out by some explosion; all manner of foodstuffs whitened to crisps in the winter air. And the most recent find: a decent coat that would be dried and cleaned and hung alongside the vacant jackets and feetless boots in the dry room kept for the unrotten clothes of the dead. But he had found no bodies. Not yet. When he had spied the coat his heart had stopped in his chest and he’d moved toward it with leaden arms, the pressure of his blood bringing color to his face and floating his head. But he’d found it mercifully unoccupied—just the current pushing its empty sleeves into arms and stretching the trunk of it as though there was a man inside. He looked at it now, lying on what had been his seat, frosting in the chill, yawning its torn lining into the air. He flicked it closed with his boot and pushed off from the lantern, the weight of the oars hot against the bruises they’d drawn already on his palms as he sculled into the river’s still-flowing center. Wull rowed, looking around his world. The banks slid past in their slow, distant way, wedges of icy sand and white banks met by woods filled with the unexpected and terrifying blackness of unwintered bark. From inside came the chirrups and cracks of forest life, but Wull—safe in the knowledge that the ursas would be sleeping—paid them little heed. A recent landslide had taken a bite from the riverbank, and fresh, crumbly soil still tumbled down its brown surface, exposing the nostril of a rodent’s burrow. Even in a year the river altered unimaginably, the shape of his boundary always shifting, falling to the snap of winter or the lash of summer’s heat. Last spring a flash storm had taken a grove of trees in the night, and the absence of their shadows on the horizon had been alarming and lasting, like the vacant space of a missing tooth. And then, in the manner of things, it became the way it had always been, and when Wull stood back and watched, his world seemed to stand still. In the far distance Oracco’s smoldering furnaces could be glimpsed as an orange glow beneath the clouds, like a buttercup tickled under a chin. But as ever its voice was silenced by the east wind, taking the beat of industry out to sea. Wull closed his eyes and pictured it: endless streets of carriages and towers, ever changing, always pushing up— higher and bolder and grander, its masses warming their feet by the fires of industry. He glanced over his shoulder to correct his course. In the split second before he met them, he could have sworn the bäta’s eyes flicked away. He rowed another few strokes. The river bubbled pleasantly, shards of ice knocking lightly against the hull. The answering silence was solid; his was the only voice for miles around. Instead of replying—and he was glad it could not, for he imagined what it might say, this boat worn smooth by generations of better men—the bäta stared forward, the weary eyes of its high prow nodding with the river toward the boathouse. Wull’s home sat on the bank, the jetty stretching for him like an accusatory finger, eyelike windows gazing out. He could feel the weight of the place in his mind like a stone on a stretched sheet, dragging everything else toward it. He tethered the bäta to the jetty. It should go inside now, he knew, behind the big doors, but he would have to go out again so soon, carrying a full bottle of whale oil that could blow him to red scraps should it catch the wrong side of a flame. The bäta’s eyes were like steel in his back as he plodded across the few feet of beach that led to the front door. He felt better once he’d closed the door. With hours until real darkness, the ursa bars didn’t need to come down yet, but even without them, the thick varnished wood was as hard as iron. He leaned his forehead on it, drawing the smell into his nose. The fire was almost out, but a tiny heat still glowed in its heart—a solitary ember amidst the wreck of his day. Alongside the aroma of the coals were the other smells of the boathouse: whale oil, tar, salt, the sweet rot of vegetables, and the pungent, damp smell of drying fungus; the dangerous smell of the smoker and the sharpness of Pappa’s lakoris; the odor of cooked fish and stewed, piled tea leaves; the cold, oily smell of iron tools; the smell of rubber boots and the polish for leather ones; the sour smell of woolen clothes drying and the clean, tinny smell of worms jarred for bait; the smell of wood and the dust of wood beside the high pitch of varnish; and the warm, sweet smell of mice that could not be caught or driven away. The river entered the house under the big doors and the thick bars of the ursa cage, and everything else was smothered by the green, head-filling stink of it. Pappa, mulching in the spare chair. The water washed in with a little wave that slapped gently on the wood. Its bobbling sounds kept the feeling of movement in Wull’s guts and bones so that he never sat truly still. Even on land he swayed a little, and it was Pappa’s cus- tom to walk with a roll in his shoulders, the way deep sailors did after years on the ocean. Wull filled the big copper kettle and carried it with two hands over to the range in an awkward waddle. The kettle had dulled already, and the reflection that peered back at him was indistinct and faceless, just the vague haze of his nut- brown skin and his tight-cropped black hair. Which is no bad thing, he thought, knowing how gaunt and bruised his face would be after two nights of fitful, twitch-waking sleep. There was a shake in his hands he hadn’t noticed—the match hopped on the strip and took four strikes before it caught. He watched the glow of the gas ring until the water began to bubble with heat, then turned to the lamps. He had cut one of the wicks the day before, and it burned now with an uneven, smoky glow. He’d seen Pappa do it, little scissors in his big hands neatly smoothing frayed edges into perfect, tapered nubs, their flames rising halfway up the globe. When all four lamps were lit it was close to daylight inside. Wull looked at his own attempt—sliced into threads as though rhat-picked. By the time the last of Pappa’s wicks had spoiled, he’d be scrabbling in the gloom and spending matches to avoid bumping into walls. But he had to try to mend them—he could hardly buy new wicks every time they needed trimming—and besides, maintenance of the boathouse was one of the Riverkeep’s duties—he’d seen it on the list in the first ledger. There were amendments on extra parchments wedged in between the pages. It was a long list. He worked on. Just as he finished his first straight cut, Pappa spoke. “Where is it?” he said in that new voice. Wull swallowed and turned to face the parlor door. Eating, thought Wull, remembering breakfast. how it dripped too, choked with fluid. Wull leaned away from the door. Pappa’s shape was just visible in the murk of the room, hunched, hair across his face, wrists bound to the arms of the chair. Wull could hear bub- bles in his throat. Pappa, sagging like wet cloth against the seat back, peered at him. His eyes were hidden behind the hang of his hair, but Wull felt their force. They were not Pappa’s eyes, nor had they been for two days; their calm, solid brown had gone milky and gray, set deep in a face that had already passed into slackness. And there was something else in them: a fug that bled into his pupils and clouded them against seeing. “Just let me finish this lamp,” said Wull, but as he lifted the scissors again they shook in his grip and he dropped them without cutting. Pappa’s voice was enormous. Wull jumped back from the crouching shadow. His shape settled into itself, and Wull knew he’d get nothing more until he brought the food. The fish heads were kept to feed seulas and gulls struggling to hunt in the frozen wasteland, but Pappa had refused to eat anything else since Wull had restrained him and tied him to the chair. He was pleased the knots on Pappa’s wrists were holding—he had only really mastered a few simple loops and never once managed the moncad’s fist, the king of the waterfolk’s bindings. Wull had learned the keep’s knots under Pappa’s watchful shadow—tiny fingers shredding as he bound and unbound his little cutting of hemp—and always, after hours of fumbled labor that strained his patience to a taut cord, the big hands would flash over his head with invisible swiftness and drop into his lap a perfect kellick hitch, sheepshank, double-overhand . . . whatever had just bested Wull and stripped the flesh from his hands. Then Wull would be scooped and carried upside down round the boathouse over Pappa’s laughing shoulders, all the blood running to his head. He looked now at the big hands, held by the knots they’d taught. If the bindings Wull had tied—simple bowlines— yielded or slipped then Pappa would escape, as he seemed intent on doing. Or he might not escape. Wull didn’t know what that would mean, but the thought of Pappa wandering loose in the boathouse while Wull slept beneath the glass buoys and the ropes filled him with a profound, stomach-chilling dread. So different to how it had been before, when Pappa’s steady movements in the small hours—mending and readying the bäta—had acted as a balm for his childish night terrors. Wull lifted a breamcod’s head—it was heavy and cold, its drying skin tacky against his fingertips. They had eaten breamcod filets for supper the night Pappa had disappeared under the ice, bickering quietly about a deliberate nothing, leaving the understanding of Wulliam’s reluctant ascension hanging unspoken above them in the web-hung rafters. He held the head out to Pappa, who lunged at it. Wull could see the bonds cutting into his wrists as he stretched, pulling the skin like it might peel off. “Untie the arms,” said Pappa. Wull held the head, mouth first, to Pappa’s face, and kept it there while he grabbed and pulled at it with lips and teeth. When it was gone, Pappa, in a choked and swollen version of his new voice, gurgled, “Again,” and Wull held up another head and another, until the bucket was nearly empty and the slack face was glistening with lost spit, scales, and skin scraps. There was part of a tail in his beard, Wull saw, and he reached to clean around Pappa’s mouth with a dampened cloth. He cleaned Pappa’s face and beard as gently as he could, holding the back of his head in his hand. Pappa relaxed slowly, the muscles of his neck softening against Wull’s palm. “Wulliam,” said Pappa, and his own voice was in the echo of the sound, quietly, like a word shouted from a great distance. “Wulliam,” said Wull. He smiled, then cried on his knees as his pappa drifted into a fitful sleep. Eventually, joints stiff from the floor, Wull went and made tea, letting the leaves stew in the undrunk cup as he sat in his own chair, Pappa’s empty and brooding beside him, looking at the Danék while the night broke over its surface and turned the narrowing ribbon of still-flowing water to rapid ink. The hand that held his mug shook slightly as night filled the boathouse, the lamps untrimmed and unlit, and Wull watched darkness spill over the books through which he had pored these last two days, the encyclopedias and the almanacs and the ledgers themselves: all the tomes in which Pappa had prided and which laid out the facts of the world in such detail. There were facts about plants, sun times, tide patterns, crop rotation, wine making, em- balming, needlework, folklore, and the forensic history of wars fought so far in the dusty past that the names of the places and soldiers were built with strangely shaped and unpronounceable letters. But he found nothing that gave a name to Pappa’s condition, to the hollow looseness of his skin or the change in his voice. Wull had read until his head ached, and had woken, curled and solid, with his face on the page, the ink running in the water from his open mouth. Now, in the silence of night, he fancied he could hear the wicks of the lanterns sputtering and freezing in the face of winter’s elemental force, their rods surrendering to the ice as it swept its glittering malice across the world, and he held his cold tea and waited for the spark of courage that would propel him to rise up and face the world outside. His world. An ocean barge puttered past, lantern bright on deck, the captain looking agitatedly at the river’s locked-in whiteness. Wull watched him raise his eyes to the lampless boathouse and shake his head. He stood then, collecting himself, feeling the balance of his feet on the boards and the strength of his muscles inside his clothes. He heaved a big, whooping sigh that became a defiant growl, and reached for his hat. A breathtaking literary adventure, perfect for fans of Patrick Ness, Neil Gaiman, and The Wizard of Oz! The Danék is a wild, treacherous river, and Wull Fobisher’s family has tended it for generations—clearing it of ice and weed, making sure boats can get through, and fishing corpses from its bleak depths. 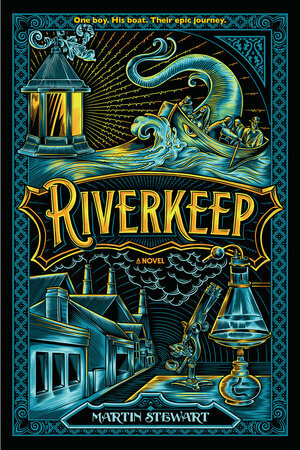 While recovering a drowned man, Wull’s father—the current Riverkeep—is pulled under. When he emerges, he is no longer himself: A dark spirit possesses him. In an instant, Wull is Riverkeep, and he must care for his half-father. When Wull hears that a cure for his father lurks in the belly of a great sea-dwelling beast known as the mormorach, he embarks on an epic journey down the river. Along the way, he faces death in any number of ways, meets people and creatures touched by magic and madness and alchemy, and finds courage he never knew he possessed.